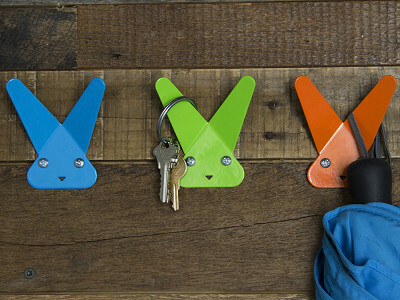 Frank Hooks is a Brooklyn, NY based company that’s putting the fun in function with bright colorful wall hooks that look like quirky little animals. Made in the USA of durable powder coated steel, each hook is held up by two screws that look just like eyes. And then, there are the ears—the perfect resting spot for a coat, keys, scarf, a bag, or just about anything else. What started with Frank the Bunny has turned into a whole cast of characters including a cat, dog, and even a moose. Created by designer David Barry, Frank Hooks bring a pop of contemporary style and a touch of whimsy to everyday clean up. Who can resist hanging up a towel, robe, jacket, or backpack with these cute little critters keeping a watchful eye over bedrooms, playrooms, mudrooms, and closets? 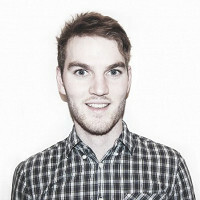 I’m David, founder of Frank Hooks. Frank and I go way back, so I know all there is to know about the little guy. I’m here to answer any questions you may have about Frank and his friends. Adorable! Simple and functional too. Details for the moose say 2 prongs for hanging, but I'm thinking it has 6 prongs with the antlers? If that is the case, would the 15 lb. load capacity still apply? @Emily Hello! The moose has a Load Capacity of 15 lbs. The two prongs for hanging refers to the two holes (eyes) where you will screw the two screws through. @Emily Thanks for the comment. The 15lb load capacity of the moose is the total weight that he can carry not the weight for each individual prong. The moose is perfect for keys, towels and jackets but a heavy laptop bag may overwhelm him. Can you tell me how far apart the eyes/holes are spaced? @Guest The holes are 1.1" apart for the rabbit, cat and dog. The moose's eyes are spaced out a little further at 1.4"
Thanks for the idea, Marcia. I'm sure David will take it into consideration. Does the bunny really have a load capcity of 500 pounds, or is that a typo? @Meri Oops - that was my typo ... A capacity of 50 pounds is listed in the description. @Meri Woops looks like that's a typo. Good spot. Frank the bunny has a capacity of 15lbs. 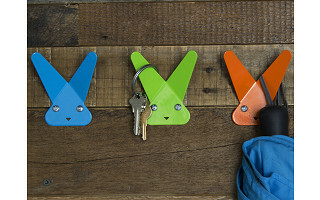 Frank Hooks is a Brooklyn, NY based company that’s putting the fun in function with bright colorful wall hooks that look like quirky little animals. Made in the USA of durable powder coated steel, each hook is held up by two screws that look just like eyes. And then, there are the ears—the perfect resting spot for a coat, keys, scarf, a bag, or just about anything else.